Whether you’re a backpacker, flashpacker or holidaymaker, Cairns, Australia is the place to be for scuba diving. Home to the Great Barrier Reef, Cairns diving has the largest and best coral reef our planet has to offer. With more dive boats than you can fling a boomerang at, diving in Cairns can be experienced in a variety of ways, so you’ll find a trip perfect for you. Whether you’re a novice or fully qualified diver, the tropical warm waters surrounding Cairns entice visitors all year round. Some of the best dive instructors in the world work here, providing introductory dives through to full courses for dive masters. Experiencing the abundant ocean life of the Great Barrier Reef is always going to be money well spent and a priceless experience. The costs of diving can vary boat to boat but if you splash out a little more, you can up the ante and see the reef in style. Most dive boats are anchored out on the reef, about an hour away from the Cairns coastline. Transfer boats leave every morning. Why not see the reef with a panoramic aerial view and take a helicopter out to the boat? A few select dive boats offer this service, with helipads on the top deck. Seeing the colourful azure waters from above is an experience not to be missed. What could be better than arriving onboard to a welcome virgin cocktail and a tropical fruit spread? Before getting a tour of the boat, you’ll be debriefed on what your day of diving will entail. 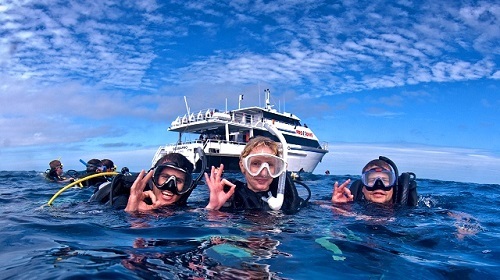 Boats offer anything up to four dives a day, often including an optional night dive. Safety is of paramount importance so all the correct protocols will be set out and you can relax, knowing your underwater experience is going to be a safe one. You’ll be kitted out with all the right gear before dipping your toes in the warm water. Visibility conditions are almost always good for both diving and snorkelling. Buddy up with your partner and be guided through some of the most jaw-dropping coral underwater wonderlands. The Great Barrier Reef is bursting with neon coloured fish, turtles, giant clams and even a harmless shark or two – bound to take your breath away. Unwind after an action packed day with a bottle of champagne whilst toasting the evening sunset. Five star chefs will spoil you with fine dining before you retreat to your intimate luxury cabin, with views out over the ocean. Spending the night on the Great Barrier Reef feels like one of those once in a lifetime moments. Spoiling yourself and making the experience a little more luxurious is pretty hard to beat, and an experience you won’t forget. 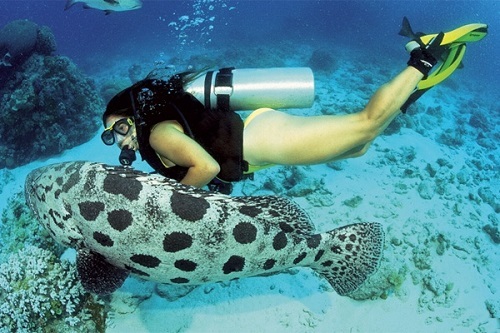 So grab you airfares to Cairns with one of the local travel consultants, such as Flight Centre and get diving! Kiri Bowers+ spent two months living and working on a liveaboard boat in Cairns. Currently writing from Bangkok, Thailand, she’s hopping country to country as a travel blogger. This entry was posted in Australia, Scuba Diving, Travel, Water Sports and tagged Australia, Cairns, Scuba Diving. Bookmark the permalink.